The BBC Africa service reports that the first 200 Nigerian troops of the UN intervention force are on their way to Mali. Nigeria plans to deploy 700 more along with fighter jets in the coming weeks. They will be leading the African forces in the UN mission. French military ally and regional neighbor Chad has committed 2,000 troops. Benin, neighboring Ghana, neighboring Niger, neighboring Senegal, neighboring Burkina Faso, and Togo also plan to participate in the police action, with probably about 400 more troops between them. The UN-created coalition (read: PDF of UNSC Resolution 2085 from December 2012) has been named the “African-led International Support Mission in Mali” (AFISMA) and is tasked with re-capturing northern Mali from Tuareg separatist groups, training the Malian Army who apparently didn’t take direction well from the US trainers, supporting the interim democratic government to prevent another military coup, and organizing the safety of humanitarian missions. The deployment has been accelerated by quite a few months due to the sudden progression of separatist troops beyond the unofficial dividing line in the conflict which prompted the start of a major French military campaign last Friday in response. France and the other Western powers believe that many of the separatist organizations in the impoverished, sparsely populated semi-desert region of northern Mali have links to terrorism including Al Qaeda affiliates. Although the Malian government has long accused the MNLA of terrorist links for the cynical purpose of getting “War on Terror” funding from Western governments, it is far more credible to assert real terrorist links between the Ansar Dine and similar Islamist insurgent operations in North and East Africa, including Al Qaeda of the Maghreb (North Africa) or more likely the Shahab in Somalia (who have themselves recently been severely disrupted by intense African Union military campaigns). This rise of Ansar Dine and their serious movements toward expanding into the more populous southern “half” of Mali has understandably caused an uptick in concern and attention from the Western governments, thus prompting the sudden French intervention last week. Meanwhile, as West African troops arrive, France (which I’m not sure will be part of the AFISMA/UN mission at all) now has 800 troops on the ground in Mali and that number is set to swell to 2,500. 50 armored vehicles have been deployed northward toward the front. 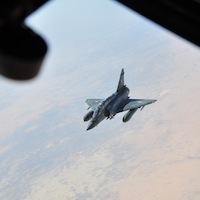 The unilateral French air campaign in the north in support of the Malian government in the south continues at full tilt out of air bases in Chad. The Malian Army is only participating lightly in ground actions coordinated with these airstrikes — hampering efforts to consolidate and hold any gains — and are reportedly fighting in “hand-to-hand combat” with rebels just 220 miles north of the capital, which seems fairly unproductive to me. Although the French operation initially dislodged the separatist forces from the informal border line between north and south this past weekend, these rebel troops suddenly reappeared on Monday much further southwest into government-held territory. However, the separatist force holding Timbuktu seems to have withdrawn entirely from the ancient city, according to locals. It’s a bit of a game of wack-a-mole right now without much ground cooperation to keep any ground “won” from the bombings. Tagged Africa, African Union, AFRICOM, Chad, France, humanitarian intervention, Mali, Tuaregs, United Nations.